I may post occasional on this blog, but Hasidology will now become my main platform. Readers can expect to see fuller, more thoughtful and better researched efforts. Be sure to take a look at my first posting entitled On the Eternal Unfolding of the Transcendent Torah, all comments welcome! Last night I sat with a few friends in a small shul in an anonymous corner of Crown Heights. We had gathered there on the evening before Yud Tes Kislev to Farbreng, and we didn't leave till the wee hours of the morning. It is very difficult to describe or capture the intimate atmosphere, the other-worldly spirit of truth and open honesty, the strangely unremarkable mix of self criticism and celebration that makes a Farbrengen. But I can highlight some of the themes that I came away with last night. This year is the 110th year since Rabbi Sholom DovBer Schneersohn, the Rebbe Rashab, termed Yud Tes Kislev the Chasidic "Rosh Hashanah". 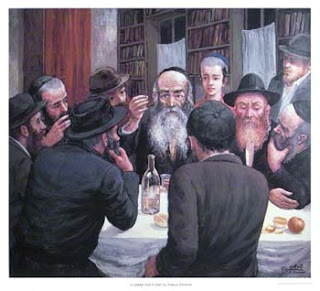 In a letter penned from Moscow to his son, Rabbi Yosef Yitzchak (later known as the Rebbe Rayatz) in Lubavitch on the 16th of Kislev 5662, he described it as "the day upon which the light and life of our souls [ohr v'chayut nafshenu] was given to us, and one might say that it is the Rosh Hashanah for the Word of the Living G-d [i.e. the teachings of Chasidism] bequeathed to us by our holy forebearers..."
Light. Transcendent windows onto the super-rational, which may yet be assimilated intellectually via the thousands of Chasidic discourses recited by the Rebbeim and studied by their Chasidim for centuries. Life. The immanent actualization of those lofty ideals, in the mind, heart and actions of the individual - in the all encompassing service of G-d. In the words of the Rebbe Rashab, we must "draw the depth and innerness of G-d's Torah and G-d's Commandments from the innerness and essence of the Infinite blessed-be-He, that it should shine in the innerness of our souls, that our entire essence (that is, the entirety of our being - both the essence and also its manifestation) should be dedicated to Him alone... all our activity and purpose (whether in matters of service... or in worldly matters...) shall be with true intent for the sake of heaven, that this is G-d's desire." Chabad Chasidism requires that the most abstract of Divine realities be made manifest within the most concrete of human endeavors. In Lekuttai Sichot Vol. V (172-9), the Rebbe explained that herein lies the boundless celebration and joy that is made manifest on Yud Tes Kislev, for it is only with the power of the Truly Infinite that the transcendent secrets of the innermost part of the Torah - embodied in the teachings of Chasidism - can be rendered immanently accessible and applicable in the concrete realm. Can an elephant fit through the eye of a needle?! The continued manifestation of the inexpressible essence warrants a truly boundless celebration. Le'chaim! Le'shonah Tovah Be'limud Ha'chasidus U'be'darchai Ha'chasidus! The day upon which Rabbi Shneur Zalman of Liadi was released from Tsarist imprisonment in the winter of 1798-9. Here is an article on the subject by Prof David Assaf drawing attention to the documentation of these events by Chabad Scholar Yehoshua Mondshine (available here). Click on images to enlarge. Here is a facsimile of the relevant section of that historic letter as published in Kuntras U'mayon (see there, pages 14-16, for a description of the circumstances under which the letter was written and received). Click on image to enlarge. S'vent'zich vu me'redt - A Question of Context? Indeed, Seeman himself (beginning at approx. 38:40) draws attention to an essential difference between what I will call their respective "styles of reading". According to Seeman, Wolfson readings emphasize "the coincidence of opposites and the sense of paradox", Seeman goes on to explain how he disagrees with this reading. "In my reading... there is actually very little focus on paradox, what there is - is a focus on the sense that opposites are often both true, which is then absorbed [or rationalised] in a kind of Lithuanian manner - 'two dinim'; this is true in this context and that's true in that context..." Thus, two contradictory statements within Chabad literature are usually to be interpreted as both being true.